All transactions are safe and secure with a reliable history in online purchasing behind each of our associates. 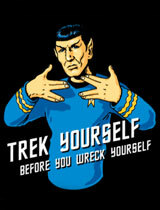 Buy the Trek Yourself t-shirt to own Star Trek clothing and merchandise. This Trek Yourself t-shirt featuring an animated style Spock will stand out in any crowd. While many fans have inadvertently overlooked the animated series which aired from 1973 to 1974, it is a vital part of Star Trek history. Animation allowed creators to design more detailed exotic worlds that were transformed into movies. This Trek Yourself Before You Wreck Yourself tee features Captain Kirk's U.S.S. Enterprise science officer Mr. Spock. Order this funny tee with a modern Star Trek XI t-shirt for the perfect sci-fi combination. In addition to the Trek Yourself tee above, browse the Star Trek Clothing Gallery for more apparel like men's and women's clothes, kids shirts or hoodies.